Controller keyboards are fitting ever more control facilities into progressively smaller units costing less and less. Is the semi-weighted Axiom 25 M-Audio's best deal yet? It doesn't seem so long ago that a two-octave keyboard would have been deemed wholly inadequate for most applications. However, as it's becoming increasingly common to gig with just a laptop and controller keyboard, the smaller the latter are, the easier it will be to simply sling them in a rucksack and go. With more of us carrying a full studio on our back, or cramming it into a corner of the spare room, it's no surprise that many miniature keyboards are thriving. The Axiom 25 is a cut-down version of M-Audio's controller range in terms of both keyboard size and — to a lesser extent — functionality. Actually, the only really significant loss is of programmable sliders — there's no room for them! The Axiom 25 is supplied with the sparsest of accessories. M-Audio evidently expect that you will use it in conjunction with a PC or Mac, and as such, they do not supply any form of power adaptor. When used with a computer, power is derived from the USB connection (a USB cable is supplied), but if you require your purchase to perform a more traditional MIDI role, another fiver on your budget should get you an external 12V adaptor. Sadly, there is no battery option. There's no printed manual either, just a Quick Start guide (consisting of instructions on how to install the software) and a tour of the Axiom's presets. This latter — a single sheet of A4 — lists the 20 presets that are shipped; so if you use Reason, or Gforce's Oddity, Imposcar, or Minimonsta, you can be up and running right away. Also included are instructions on how to configure the Axiom for use with Ableton's Live — and a lite version of Live is included free with the keyboard. However (and this confused me at first), this version doesn't support any form of remote MIDI control, and therefore the instructions don't apply. This isn't exactly joined-up thinking if its inclusion was supposed to demonstrate the power of the Axiom! Physically, the Axiom strikes you as 'chunky'. A rounded plastic body in austere grey provides a solid base for the semi-weighted two-octave keyboard. I'm guessing that the keyboard is the reason the Axiom is not more slimline. It boasts channel aftertouch and an excellent feel, and I revelled in what I reckoned to be the perfect compromise between a weighted piano action and the lighter response of a typical synth. This was a pleasant surprise in a controller that, at 6lbs, is still reasonably compact and lightweight. The top right-hand side of the panel features eight velocity-sensitive pads that are ideal for banging in drum patterns — it's certainly far more fun using these for drum programming than a keyboard, and the pads are probably the biggest selling point after the keyboard action. The standard pitch and modulation wheels are rounded and responsive; all is good so far. Instead of standard knobs, the Axiom features eight continuous encoders — more on these later. Finally, the buttons are of a decent size and are made of black rubber; they too seem designed to be tapped with confidence. Six of these are programmable and arrayed as standard transport controls, although they may be assigned to a variety of roles. Before I start to explore how this all works, I'll complete my tour with a quick look at the rear panel (pictured overleaf). This contains a MIDI in and Out socket, the USB port, the connector for the optional power adaptor, the On/Off switch, and quarter-inch inputs for sustain and expression pedals. When you supply power, the display lights up in a rather glorious blue. Nine buttons directly beneath the display are used to recall memories and assign functions to the encoders, the buttons, pads and keyboard zones. There aren't dedicated buttons for everything, though; for example, to quickly send a snapshot of all controllers, the plus and minus keys are pressed together, or to invoke the the panic function (should you get any hanging notes), you press Mute and Null. A number of deeper options are available courtesy of the Advanced button. Press this and various menus can be quickly accessed via the keyboard (whilst Advanced is active, the keyboard doesn't transmit notes). All the Advanced functions are printed in white above each key, from the lowest (Control Assign) to the top (which serves as an Enter key). It's all pretty easy to get around, and certainly a workable compromise given the panel space available. The Axiom's controls are divided into three functional groups — referred to as A, B and C. Group A contains the keyboard, zone, aftertouch and mod wheel settings, whilst group B stores the assignments of the encoders and transport controls. This leaves the trigger pads defined in group C. Most of the time you won't even think about this grouping, but as each group can be recalled individually, this allows you to quickly mix and match controller definitions from several memory locations. 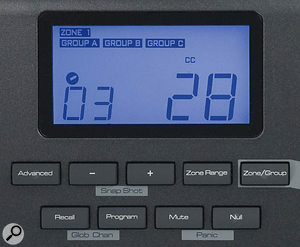 The Zone/Group button transforms the transport controls into Zone and Group selectors. Three keyboard zones are available and are activated/deactivated using the Loop, Rewind and Fast Forward buttons; to activate all three at once, press the three keys simultaneously. Zones are something you'd more commonly associate with longer keyboards — there can only be limited uses for having three of them over a two-octave physical span. 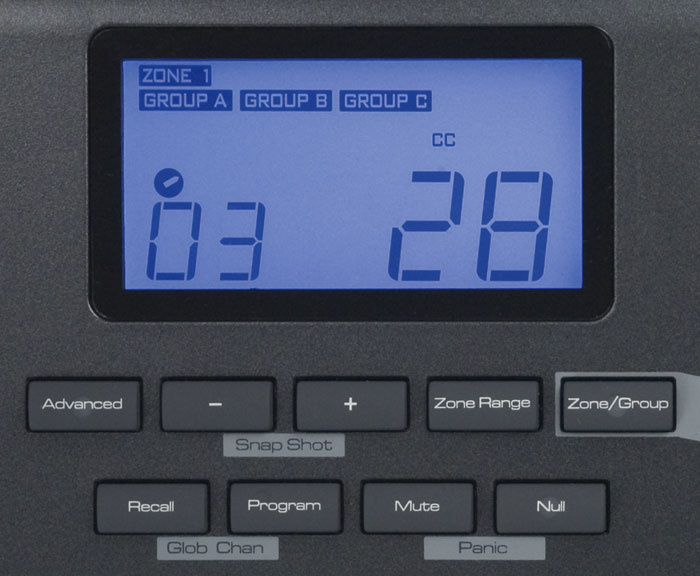 Nevertheless, you can split and layer zones on the MIDI channel(s) of your choice, each can be transposed independently and they can occupy any range of MIDI notes. Having set up your encoders, mod wheel, transport controls, programmable pedals and so on as required, you can store the result to one of the 20 memory locations. Despite the large display, there is no facility to name your patches. In a departure from most other controller keyboards, the Axiom is supplied with endless rotary encoders — eight of them. These encoders are subtly notched, making it easy to add single-value increments, but I found it harder to make smooth, fast sweeps until I discovered there were three different acceleration curves to choose from. These allow you to tailor the response depending on whether you wish to leap through large increments or perform fine tuning. You can even turn acceleration off if you only wish to work in discrete increments. With practice, I was able to zip most of the way through a control's values with a single twirl of my fingers, but I couldn't say I truly mastered this. I did eventually learn to perform smooth fades by exerting smooth, even pressure (over multiple turns), but ultimately this type of control is something you'll either like or you won't. Until you turn an encoder (whereupon the display shows its value), there is no visual clue to its setting. Encoders therefore score highest when used with software — so you can see the values on-screen at all times. The last position of each encoder is remembered, so the Axiom always has an initial value to start from. The action of the Mute and Null buttons on the Axiom's controls is important. Whilst Mute is active, the outputs of all controls are muted, so you can position any control to the stored value without creating any sudden leaps. Null, on the other hand, prevents data output until you pass through the stored parameter value. This is a slicker way of preventing sudden leaps, although it does require support from the connected software. The manual rightly points out that not all software caters for endless encoders, but does suggest various techniques to try and get it working. Finally, and still in pursuit of smoothness, you can send a snapshot of all current values prior to touching a control for the first time. Even on a controller keyboard this affordable, you get expression- and sustain-pedal connectors, plus MIDI via a choice of USB and five-pin ports!Photo: Mark EwingThe Axiom also functions as a USB-to-MIDI interface, so you can connect a MIDI instrument to its five-pin MIDI In and route the data via USB into your computer with no need for a separate MIDI interface. Similarly, you can send MIDI to the Axiom's USB port and route it out via its five-pin MIDI Out socket to control any external modules you may have. The eight pads can be programmed for typical note on/off duties — they're ideal for triggering percussion. They can also be programmed as 'toggles' so that one hit of a pad generates a note on, and a second hit generates the note off; this is useful for starting and stopping loops. With nine possible response curves and three fixed velocity values, you should find one to suit your playing style — I certainly found them very comfortable to use. One interesting application of the pads is for transmitting MIDI continuous controller (CC) values. If you remember the days of ARP synths, you'll recall that some had 'PPC' — proportional pitch control. This meant you could push a pad and generate bend or vibrato — and the harder you pushed, the more vibrato you got. The Axiom's pads can replicate this feat: each can send the controller message of your choice, and you can even define the range over which the pad transmits (as you can for the encoders, wheels and expression pedal too). So if you wanted to vary filter resonance between a value of 30 and 80, you'd set these values as your minimum and maximum. Then, whilst playing, just press the pad. This gives you a markedly different type of performance control compared to that offered by moving a knob or slider. You can also use Enigma, the free software editor, with the Axiom, but this isn't available on the CD of driver software; you need to download it from M-Audio's web site. It's worth the effort, though, because it renders assignment of all the Axiom's controllers, pads and zones beautifully simple. Editing the controller transmission of an encoder, button or pad is as intuitive as dragging the appropriate command to a graphical representation of the Axiom. So if you want to assign one of the pads to send MIDI notes, drag in the MIDI Notes option from a list, and then just set the actual note you want in the Controller Edit window. The software also allows you to manage a library of patches should the onboard limit of 20 prove inadequate. The Axiom is capable of transmitting most types of MIDI data that you'll need — the exception being SysEx. In that respect, there are several preset SysEx datatypes, the most notable being MMC (MIDI Machine Control) which is used for transport functions. M-Audio have devised an interesting method of assigning controllers other than the usual range of CCs. Thus, MMC, pitch bend, NRPNs, and aftertouch are treated as if they are tagged onto the end of the MIDI continuous controller range. For example, to assign a fine RPN value, use controller 133. A table of these is shown in the manual; it's all very simple and transparent to use. 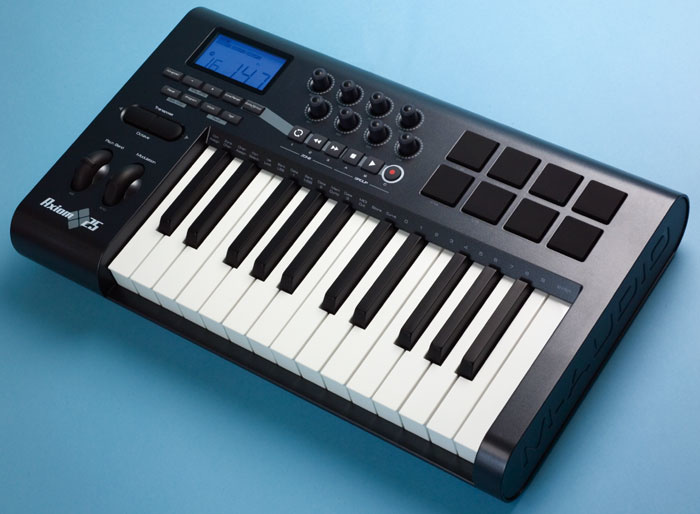 For many, the feel of the keyboard and inclusion of drum pads will be enough to set the Axiom apart from its rivals. Certainly there's a reassuring solidity about the pads, and I really came to value dedicating them to key percussion voices. When using a small keyboard you often have it transposed and I, for one, tend to forget which octave I need for particular drums. This is a lovely solution. Perhaps I'm just weary of spin, but I didn't find the endless encoders to my taste. I feel that standard knobs are easier to get on with on a generic controller such as this; I missed the visual feedback. The display is large and clear so I wondered why it wasn't used to show the values of all the encoders at once. The display was pretty informative, though, and I was able to do everything I needed with the buttons and keyboard, although I found programming via the Enigma software to be even faster and easier. I'd recommend that all Axiom owners download the editor and give it a try. Generally, I couldn't find much to dislike with the Axiom. I thought it was stingy not to include a power adaptor, because I tend to work with MIDI rather than go the USB/computer route. Similarly, a printed manual would have been useful, especially for the appendices and their additional controller lists, but these issues are hardly showstoppers. Inclusion of Ableton Live Lite was a curious choice, given its lack of remote controllability; however, I enjoyed using it. I've never subscribed to any 'gateway' theories before, but this program really could lure you down the path of serious addiction. There is plenty of two-octave controller competition around, and the Axiom 25 is neither the slimmest, smallest, nor the cheapest. M-Audio are presumably hoping the inclusion of drum pads and the quality of the keyboard will give them an edge — and they may be right. Either way, we've never had so much choice at this price. Keyboard feels great and has aftertouch. Supplied Ableton Live Lite doesn't support MIDI remote control. The Axiom 25 is an amazingly affordable chunky plastic controller keyboard with integrated drum pads and endless rotaries. Whilst these give no visual feedback, they will surely find favour with those using the appropriate software.